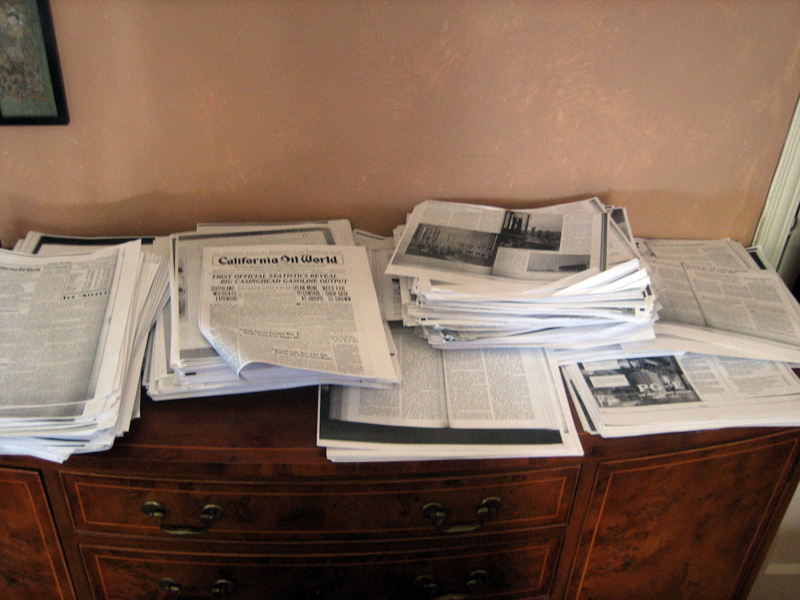 Graham Foundation > Grantees > Frank Ruchala Jr.
Frank Ruchala Jr., Stacks of photocopied articles from regional publications related to oil's impact on Los Angeles' development, research materials. A little-known fact about Los Angeles is that it sits above one of the world's largest oil reserves. Drilling has been occurring since the 1890s, with the area supplying almost a quarter of the U.S. oil needs in the 1920s and that same percentage of California's needs today. Remarkably, this oil production barely registers in the region's collective conscience and little work has been done on the relationship between the fuel source and the region built above it. This study sets out to understand the role oil played in Los Angeles's interwar (1918–39) development, when the region experienced both its greatest oil booms and also transformed itself into the nation's second-most populous area, largest industrial center, and sprawling auto-centric metropolitan prototype. Frank Ruchala Jr. is an associate urban planner and designer in the NYC Department of City Planning's Manhattan Office and an adjunct assistant professor of urban design at Columbia University. Ruchala's professional and independent work has been exhibited and published internationally, most recently as a winner in the Long Island Build-a-Better-Burb competition. The 33-year-old holds master's degrees in both urban planning and architecture from Harvard's Graduate School of Design and a BA in urban studies from Rutgers University. He spotted his first Los Angeles oil well almost a decade ago on his first trip to the region. It has been a personal research topic ever since, culminating in last year's publication of a chapter in the book Infrastructural City: Networked Ecologies in Los Angeles, which described the region's conflicted relationship with its underground resource.